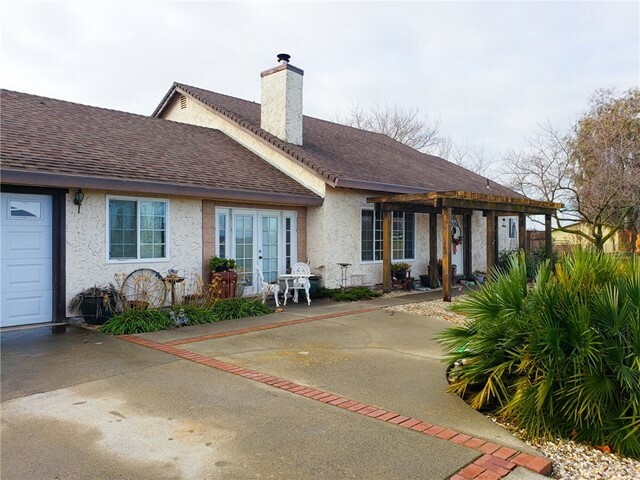 Fantastic 3 bedroom, 2 bath home with a POOL, SHOP, and RV ACCESS on a HUGE CORNER LOT in Corning! This 1670 Sq Ft home is just what you have been searching for! Kitchen is adorned with beautiful marble counter-tops, all electric appliances, and plenty of cabinet space. Living room and bedrooms are all carpeted. Enjoy your favorite book next to the cozy pellet stove on a cold winter night! Enclosed breezeway makes for a great bonus room to be used as an office, family room, game room, or whatever your heart desires! Take a dip in the refreshing in-ground pool on those hot summer days or just enjoy a relaxing afternoon on the back patio! There are even all the electrical hook-ups for you to put in a spa! Large driveway and 2 car garage provide tons of room for parking and there are even RV hookups! Yards are spacious, landscaped, and well maintained. Bring your toys and projects, with 2.74 acres and huge insulated shop, there is room for all! Lot Size, Sq Ft and year built all taken from county record. Buyer to verify all information to satisfaction.